Lewis Harry Adler, Sr., M.D. What Happened to William Hendricks’ Family? What Happened to the Wife and Children of Timothy Matthias Snyder? Captain Charles Hickman Yard, Sr.
What Happened to the Family of John Diaz? William Henry Egle, M.D., M.A. Co. C, 47th Reg’t., Pa. Vols. a resident of North’d. County, Pa.
Young Watson’s remains were later moved, with those of other men from the 47th who had perished in Florida, to a growing cemetery associated with the Marine Hospital near Fort Barrancas – now the Barrancas National Cemetery at the U.S. Naval Air Station in Pensacola. Before that early heartache, however, Sergeant Frank M. Holt was laid to rest in the cemetery adjacent to the U.S. Soldiers’ and Airmen’s National Home in Washington, D.C. after succumbing to Variola at the Kalorama General Hospital in Washington, D.C. on 18 October 1861. He had only been a member of the 47th’s Company D since August. His family later created a cenotaph for him at his hometown cemetery in New Hampshire to ensure he was not forgotten. Reuben Wetzel has also been at peace at the National Soldiers’ Home Cemetery since 1861. A Cook for G Company, he died 17 November from complications related to a fractured tibia, following a wagon accident which occurred while the regiment was moving from one camp site to another. Formerly known as the Military Asylum Cemetery, the Soldiers’ Home Cemetery was established within view of a cottage on the Home’s grounds used as a place of respite by President Abraham Lincoln and his family. Established in August 1861, the Soldiers’ Home Cemetery is also the final resting place of numerous Congressional Medal of Honor winners. Peter Swinehart, a 21-year-old shoemaker from Sunbury who was wounded while serving as a Private with the Sunbury Guards (Company C) during the Battle of Cedar Creek 19 October 1864, died less than two months later at Jarvis General Hospital in Baltimore. He was interred in Maryland’s Loudon Park National Cemetery. Private Allen Faber, who had just enlisted in Company A of the 47th on 20 February 1865, was interred at Arlington National Cemetery. He died at a regimental hospital 7 June 1865 from wounds received in battle. 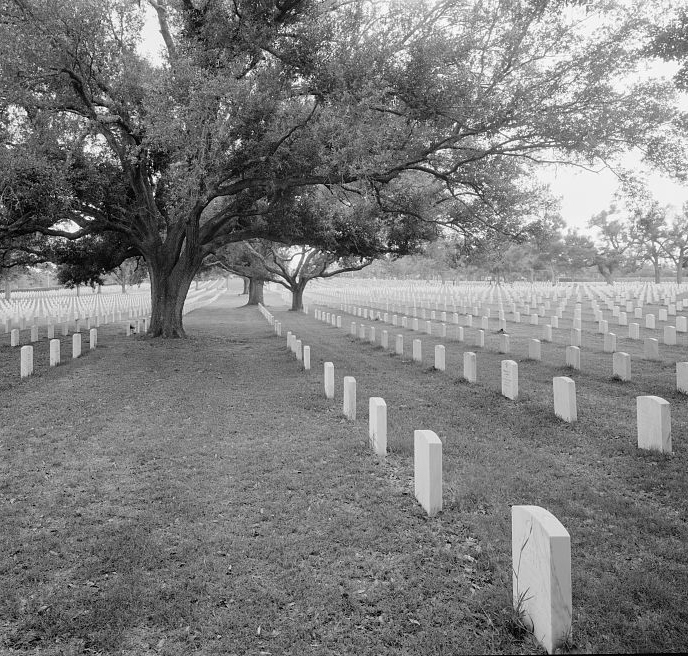 Other men from the 47th rest even farther from home – with some thought to be interred on the parade grounds at Fort Jefferson in Florida, and others known to have been buried with military honors at national cemeteries in Virginia (Alexandria and Winchester), Salisbury (North Carolina), Beaufort or Florence (South Carolina), Natchez, and Louisiana (Baton Rouge and Chalmette). They, along with the many men from the 47th who completed their honorable service and returned home to the Commonwealth of Pennsylvania, are now together again thanks to the creation of a special “virtual cemetery” by the primary author of this blog. It is hoped that this online gathering place will be frequented by those engaged in researching their respective family histories, as well as by professional historians, Civil War reenactors and others interested in learning more about the men of the 47th. Those visiting this virtual cemetery will find the graves of those who returned home from prison camps or via discharge by Surgeon’s Certificate but, sadly, died of complications from wounds or disease. They will also find the graves of the many who went on to live long, full lives and become the great-grandparents and great-great-grandparents of the men and women researching the 47th today. Many of these ancestors were interred in cemeteries in the towns where they were born or in adopted communities in Alburtis, Alfarata, Allentown, Altoona, Ambler, Ashland, Augustaville, Bala Cynwyd, Bangor, Bartonsville, Bath, Bechtelsville, Belfast, Bellefonte, Bernville, Bethlehem, Big Cove Tannery, Bird in Hand, Boalsburg, Braddock Hills, Breinigsville, Bridgeport, Brookville, Burnham, Catasauqua, Catawissa, Chapman, Churchtown, Clearfield, Coolbaugh, Coopersburg, Coplay, Danielsville, Donaldson, Doylesburg, Dravosburg, Drexel Hill, Duncannon, Dunmore, East Greenville, Easton, Ebensburg, Egypt, Elliotsburg, Emmaus, Erie, Eschol, Everett, Factoryville, Farwell, Fernwood, Fleetwood, Flemington, Forks Township, Forksville, Fountain Hill, Freemansburg, Fullerton, Girard, Gowen City, Hamburg, Hanover, Harrisburg, Hazleton, Hecktown, Herndon, Honey Grove, Howertown, Hunter, Huntersville, Ickesburg, Jersey Shore, Johnstown, Kreidersville, Kulpsville, Kutztown, Landisburg, Laurys Station, Lawrenceville, Lebanon, Lehighton, Lewisburg, Lewistown, Little Germany, Liverpool, Lock Haven, Lower Saucon, Loysville, Lyleville, Lynville, Macungie, Maitland, Marysville, Mauch Chunk (now Jim Thorpe), Maxatawny, McConnellsburg, Mechanicsburg, Menno, Mercersburg, Mertztown, Middleburg, Middletown, Mifflintown, Montdale, Moorestown, Mount Bethel, Nanticoke, Neffs, New Albany, New Berlin, Newberrytown, New Bloomfield, New Buffalo, Newport, Newton Hamilton, New Tripoli, Northumberland, Oil City, Orefield, Orwigsburg, Panic, Paradise, Peckville, Philadelphia, Pitman, Pittsburgh, Pleasant View, Pottstown, Pottsville, Portland, Pricetown, Quakertown, Reading, Red Cross, Richfield, Riegelsville, Roslyn, Salisbury, Saylorsburg, Sayre, Scranton, Shamokin, Sharon, Shenandoah Heights, Shermans Dale, Shippensburg, Shiremanstown, Slatington, South Coatesville, Spring Mills, Stewartstown, Stockertown, Stroudsburg, Sunbury, Sweet Valley, Tannersville, Thompsontown, Trexlertown, Trumbauersville, Tyrone, Washingtonville, Wayne, Waynesburg, Weatherly, Weisenberg, Weissport, Wellsville, West Catasauqua, Whitehall, Wilkes-Barre, Williamsport, Wind Gap, Wolf’s Crossroads, York, and Zion’s View. Their progeny went on to become the artists, educators, engineers, entrepreneurs, medical practitioners, scientists, and other laborers and community leaders who fueled the nation’s transformation during the 20th century. Those men of the 47th who sought their fortunes elsewhere or eventually retired to U.S. Homes for Disabled Union Soldiers are known to have been interred at Arlington with others now at rest in California (Los Angeles, San Francisco, and Ukiah), Colorado (Golden), Florida (Orlando), Georgia (Fitzgerald), Illinois (Chicago, Danville, Eureka, Penrose, and Quincy), Indiana (Marion and New Albany), Iowa (Bedford, Des Moines, Kirkman, Ladora, and Ottumwa), Kansas (Bennington, Burlingame, El Dorado, Gorham, Holland, Leavenworth, Marquette, and Papillion), Maryland (Baltimore and Manchester), Michigan (Berrien Springs, Detroit, Lower Flatbush, Wrights Corners), Missouri (Lemay), Nebraska (Omaha, Shelby, and West Point), New Jersey (Belvidere, Phillisburg, Totawa, Vineland, and Washington), Ohio (Bloomville, Dayton, Defiance, and Lancater), Oklahoma (Purcell), Oregon (Woodburn), Tennessee (Johnson City), and the State of Washington (Seattle). However, many remain absent from view – their graves still not yet located. This is largely because some in the 47th were forced to leave behind friends who fell during unexpected skirmishes or raging battles – and because the Union Army’s record keeping was simply shoddy at war’s outset. In other cases, graves have been identified, but are not well documented. Many are simply waiting to have “faces put to the names” – the specific regimental service of each soldier acknowledged, the countless repetitions of “unknown” replaced by applicable birth dates and hometowns. It is hoped that, eventually, the grave of every member of the 47th Regiment of the Pennsylvania Volunteers will be located and properly marked, and that a biographical sketch will be written and posted for each soldier.